Are you running to your future or running from your past? This was a few years ago, and I was helping a friend through a bit of a messy split. I know there’s two sides to every story, and I was only hearing one of them, but I think, objectively, this guy was being a bit of a douche-bag. And I could feel for my friend. The relationship wasn’t working. They’d both probably be better off going it alone. But then there’s the kids, and her life plan never involved becoming a single mum in her 40s. She wanted the stability of family. She didn’t want him. And she didn’t know what to do. She kind of had me there. I do tell people that. A lot. Most of my advice and half of my blogs are just “pull your finger out” packaged up in different forms. But that didn’t seem right in her situation. But it was hard to put my finger on why. It’s definitely true you don’t want to be running off half-cocked. Property is definitely a game where it’s good to have a level head, and a clear, well-thought-out game plan. And most horror stories happen in property when people just decide to throw some money at a property and “hope for the best”. But that wasn’t where she was at. We had been talking about her reno’s for months. She had a lot of good ideas, and a clear sense of how she could add value. She also had a clear picture of the kind of deal she was gunning for. She wanted something cheap, probably in a regional area, where she could manufacture growth. Possibly a one into two sub-division, but nothing bigger than that. She had a strategy in mind, and an idea of the kind of deal that would fit into that strategy. So she wasn’t running off half-cocked, but she was still running. In this case, she wasn’t running to. She wasn’t running joyfully towards her next deal and a new financial future. She was running from. 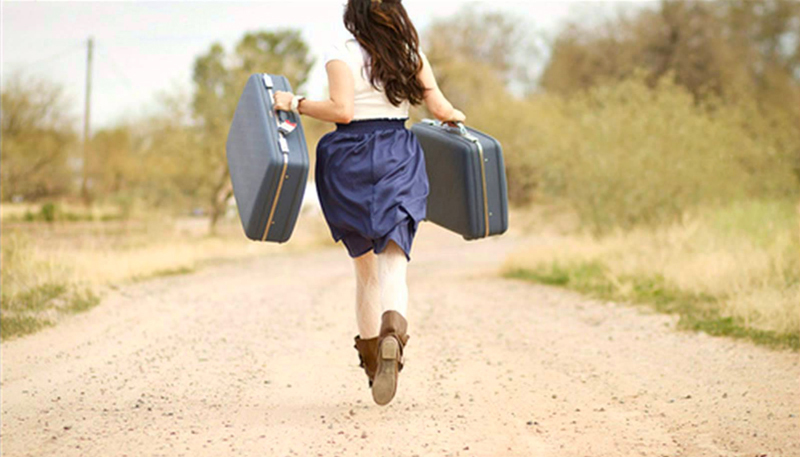 She was running away from the hurt in her marriage and the pain involved in charting a course out of the mess she was in. She was running away from this. She was trying to escape. Now on the face of it, this running to and running from might look like exactly the same thing. They might both involve doing a reno and refinancing. They might both involve buying a cheapy in a regional area. For all anyone else could tell, they’d look exactly the same. But there is a world of difference between them. The universe becomes a very different place depending on what kind of running you’re doing. When you’re running to, full of excitement and gratitude, the universe becomes you’re collaborator – showering you with all sorts of useful synchronicities. When you’re running from – the universe just seems to get in your way, throwing all sorts of obstacles down in your path. Is that because the universe hates you when you’re in your fear? Is it an inconsistent universe? Do the rules change depending on your “mood”? No. The universe still loves you. It just wants you to go back and take the medicine you were given – the medicine you need. And if it has to trip you up every step of the way, it will. Pain, for example, is a medicine and its work is slow and deep. It can’t be rushed. And that’s what I wanted for my friend. I felt like there were important lessons to unpack out of her pain – about the mindset she went into her relationship with, the kind of person she attracted, the way they both grew or inhibited each other, who she had become and how she was going to find herself again outside of her relationship. The pain was an invitation to stop, clear the decks, and go into all of this. I just didn’t feel like she was doing herself a service – honouring an opportunity for growth – by rushing off and executing a bunch of plans – no matter how good those plans actually were. I just wanted her to slow down, and give her grief the time it needed. I won’t bother finishing this story. We’ve already hit the key take-away, and to be honest, I don’t remember much after opening the fourth bottle. But just remember this distinction between running from and running to. It’s a remarkably useful tool to have in your tool kit. Ever found yourself ‘running from’ when you thought you were ‘running to’?